Use of the Service is void where prohibited. The CreepSquash Service is intended solely for users who are thirteen (13) years of age or older. Certain information is required by users upon request to CreepSquash, which includes basic account information such as name, zip code and referral source. Users must also submit a valid e-mail address and allow permissions through the Facebook login system as a parent and those of each child to be monitored, in order for the service to be effective. By using the Service you represent and warrant that (a) all information you submit is truthful and accurate; (b) you will maintain the accuracy of such information; (c) you are 13 years of age or older; and (d) your use of the Service does not violate any applicable law or regulation (d) your child has consented to the service and consents to your access of necessary details of the respective Facebook account and credentials. Membership may be terminated without warning if CreepSquash believes that any User is under 13 years of age or operating without the explicit consent of all concerned parties. In addition to registration to use CreepSquash, Facebook credentials are required in order to use the features of this service. The Service uses various public Facebook APIs between CreepSquash and Facebook. CreepSquash does not store User Facebook credentials, but CreepSquash does store authentication tokens and the necessary User information needed to provide the service. Users must provide a designated and valid e-mail address respective to where monitoring alerts and activity updates should be sent. Further, by agreeing to these terms, each User acknowledges that CreepSquash is authorized to send e-mail correspondence to those addresses you provide as the primary return address on file. CreepSquash membership includes select services that are subject to a free trial period at the discretion of management. The Service and payment is billed annually for each Facebook account monitored under the Single Child Plan or a Flat Rate for 2-5 children under the Family Pack. All payment processing is conducted through Paypal. All sales of services are final and due to the annual billing process, there are no refunds or prorated period adjustments. CreepSquash cannot be held responsible for any third party, user or Paypal errors or omissions. Premiums are set for annual renewal in advance and will be charged at the end of one calendar year from the date the user is charged (at end of initial 30 day trial). The annual renewal is automatically set and can be turned off by the user through Paypal at any stage prior to the following period billing. Without User cancellation, Membership will renew automatically on an annual basis with the applicable annual Member fees billed to the account through an automated process, as identified and authorized by the User at the time of enrollment in the Membership. You may cancel your Membership at anytime to avoid future billing as explained under the Account Settings section of the Web site. At any time, CreepSquash reserves the right to modify, suspend, alter or terminate Service provided to Users for any reason. CreepSquash may modify the service in its sole discretion, with or without prior notice. This applies to the free trial period and paid Services. You accept and acknowledge that CreepSquash reserves this right and agree that CreepSquash cannot be held responsible for any such modification or discontinuation of the Service. FFEATHERBROOKE, INC., CANNOT NOT BE HELD LIABLE FOR ANY DAMAGES INCURRED IN CONNECTION WITH THE USE OF THE SERVICE. THIS INCLUDES ANY DIRECT, INDIRECT, CONSEQUENTIAL OR INCIDENTAL DAMAGES THAT MAY ARISE FROM THE USE OF THE SERVICE, THE FAILURE OF THE SERVICE, OR THE TERMINATION OF THE SERVICE. THIS LIMITATION OF LIABILITY ALSO APPLIES TO ANY LOSS OF DATA, INFORMATION OR CONTENT THROUGH FAILURE OF THE SERVICE OR INTERRUPTION OF TRANSMISSION. FEATHERBROOKE, INC., CANNOT BE LIABLE FOR ANY HARM OR LOSS ARISING FROM UNAUTHORIZED ACCESS TO DATA, INFORMATION OR TRANSMISSION, INCLUDING, BUT NOT LIMITED TO TANGIBLE OR INTANGIBLE LOSS OF REVENUES, PROFITS, DATA OR INFORMATION. YOU AGREE THAT FEATHERBROOKE, INC., IS NOT LIABLE FOR ANY DAMAGES ARISING FROM THE INTERRUPTION, CANCELLATION OR SUSPENSION OF THE SERVICE, REGARDLESS OF WHETHER THE FAILURE OF SERVICE IS ANNOUNCED, JUSTIFIED, INTENTIONAL, UNINTENTIONAL OR NEGLIGENT. YOU EXPLICITLY AGREE THAT ACTIONS OF OTHERS, DIRECT OR CONSEQUENTIAL, ON FACEBOOK OR IN THE REAL WORLD, WHETHER DUE TO FAILURE OF THE SERVICE OR OTHERWISE, ATTACHES NO LIABILITY TO FEATHERBROOKE, INC., ITS' OFFICERS, SHAREHOLDERS, AGENTS OR STAFF IN ANY MANNER WHATSOEVER AND SAME IS NOT LIABLE FOR ANY DAMAGES OR CLAIMS WHATSOEVER ARISING, REGARDLESS OF WHETHER THE FAILURE OF SERVICE IS ANNOUNCED, JUSTIFIED, INTENTIONAL, UNINTENTIONAL OR NEGLIGENT. THE RESPONSIBILITY TO MONITOR YOUR CHILD'S ACTIVITIES IS SOLELY THAT OF THE PARENT AND GUARDIAN, ACTING WITH CONSENT, AND NOT THAT OF FEATHERBROOKE, INC.. CERTAIN JURISDICTIONS DO NOT PERMIT THE LIMITATION OR EXCLUSION OF LIABILITY FOR INCIDENTAL OR CONSEQUENTIAL DAMAGES; SO IT IS POSSIBLE THAT CERTAIN LIMITATIONS DESCRIBED ABOVE ARE NOT APPLICABLE TO CERTAIN USERS. FEATHERBROOKE, INC. PROVIDES THE SERVICE "AS IS" AND WITHOUT WARRANTIES OF ANY KIND, EXPRESS OR IMPLIED, TO THE FULLEST EXTENT PERMISSABLE BY LAW. FEATHERBROOKE, INC. FURTHER DISCLAIMS ALL OTHER WARRANTIES, INCLUDING THE IMPLIED WARRANTIES OF MERCHANTABILITY OR FITNESS FOR A PARTICULAR PURPOSE AND IMPLIED WARRANTIES ARISING FROM COURSE OF DEALING OR COURSE OF PERFORMANCE. FEATHERBROOKE, INC. DOES NOT WARRANT UNINTERRUPTED OR ERROR FREE FUNCTIONS CONTAINED WITHIN ITS SITE OR ITS CONTENT OR THE GUARANTEE THAT ITS SITE OR SERVERS WILL REMAIN FREE OF VIRUSES OR OTHER HARMFUL COMPONENTS. YOU UNDERSTAND AND REPRESENT THAT ALL DATA, INFORMATION AND OTHER MATERIAL SHARED BY YOU THROUGH THE SERVICE ARE THE SOLE RESPONSIBILITY OF YOU AS THE END USER. FEATHERBROOKE, INC. IS NOT RESPONSIBLE FOR ANY LOSS OF DATA OR HARM DONE TO YOUR COMPUTER, SYSTEMS OR OTHER EQUIPMENT IN CONJUNCTION WITH USE OF THE SERVICE. YOU UNDERSTAND AND AGREE TO ASSUME RISK AND RESPONSIBILITY BY AGREEING TO THESE TERMS. 11. RESALE AND COMMERCIAL USE. The User's right to use the Service is personal and no part, portion or entirety may be resold for any reason. The CreepSquash service is intended for non-commercial use, other than marketing under our partner programs. You agree to abide by all CreepSquash and Facebook standards and applicable local, state, national and International laws and regulations with the use of the Service, and you agree not to interfere with the use and enjoyment of the Service by other users. You agree to be solely responsible for your actions through the Service. You agree not to impersonate any person or entity, including but not limited to: A CreepSquash official, or falsely state or otherwise misrepresent your affiliation with a person or entity. In addition, you represent, warrant and agree that no materials of any kind submitted through your account or otherwise posted, transmitted, or shared by you on or through the Service will violate or infringe upon the rights of any third party, including copyright, trademark, privacy, publicity or other personal or proprietary rights; or contain libelous, defamatory or otherwise unlawful material. You must be at least 13 years of age to use CreepSquash. By accessing this site, you agree not to copy or reverse engineer the site or Service or launch a service, directly or indirectly, that is substantially similar to CreepSquash. You agree to: (1) comply with all laws regarding the transmission of technical data exported from the United States through the Service; (2) comply with all regulations, policies and procedures of networks connected to the Service. upload, post, transmit, share, store or otherwise make available content that, in the sole judgment of CreepSquash, is objectionable or which restricts or inhibits any other person from using or enjoying the site, or which may expose CreepSquash or its users to any harm or liability of any type. CreepSquash may, at its sole discretion, immediately terminate your access to the Service should you violate conduct that conforms to these terms and conditions. You agree to use any content provided for personal use only and agree not to re-distribute the content in any form whatsoever. You further warrant and agree not to: (a) "talk" or otherwise harass anyone; (b) collect personal data about other visitors or Members or any other person for unlawful purposes; or (c) attempt to gain unauthorized access to the Creep Squash site or engage in any activity that disrupts, diminishes the quality of, interferes with the performance of, or impairs the functionality of the site. By using the Ask A Friend feature and otherwise: (i) you agree you will not make such information public, or share with any other person to the detriment of any person in any manner whatsoever, and (ii) you will act with good judgment and good faith, and (iii) you will take no such action other than in talking to your child about the appropriateness of friends. By using this feature you agree this is subject to clause 9 Limitation of Liability. If there is a dispute between yourself and a third party, you understand and agree that CreepSquash is under no obligation to become involved. In the event that a dispute arises with one or more third parties, you hereby release CreepSquash (including its employees, shareholders and business partners) Parties from claims, demands and damages (actual and consequential) of any nature, known or unknown, suspected and unsuspected, disclosed and undisclosed, arising out of or in any way related to such disputes and/or the site. To Contact the Copyright Agent for notice of claims of copyright infringement on this site, please forward communication to: support@creepsquash.com. You shall not use any device, software or routine to interfere or attempt to interfere with the proper working of the site or any transaction conducted within the site. You may not take any action which imposes an unreasonable or disproportionately large data load on the CreepSquash infrastructure. The laws of the State of California shall govern this Agreement and the relationship between the User and CreepSquash. You agree that any grievances shall be settled according to the procedures and laws within the jurisdiction of San Diego County, in the state of California. You further agree that any claim, cause or action related to the Service or this Agreement must be filed within one (1) year after such claim arises. The headings used to describe the sections of this Agreement are solely for descriptive purposes. They do not imply or refer to a specific legal description or obligation. 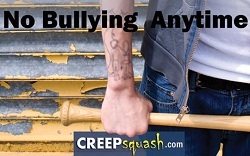 Any questions or comments can be directed too support@creepsquash.com. "Brilliant, I am not taking any chances with my son not being protected!" - Lorinda & Justin S.